It’s best not to interpret this as an empirical claim, but a carefully-thought-out bid for Internet immortality. It has the sublime combination of supreme self-confidence and utter cluelessness of previously successful memes such as “I am aware of all Internet traditions” and the “argument that has never been made in such detail or with such care,” but with added Greenspanny goodness. I tried to think of useful variations on the way in to work this morning – “With notably rare exceptions, Russian Roulette is a fun, safe game for all the family to play,” and “With notably rare exceptions, (the Third Punic War for example), the Carthaginian war machine was extremely successful,” but none do proper justice to the magnificence of the original. Within 24 hours, the clever folks at Crooked Timber generated more than 330 Greenspanisms along those same lines, forming one of the most hilarious comments’ threads in memory. An instant classic. 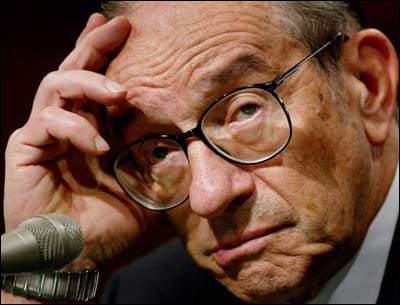 Greenspan’s legacy as Chairman of the Fed might be rather shaken, but his contribution to the history of rhetoric is now undisputed. If you look at the history of the world, up until 1700 nothing much happened—GDP growth per capita was essentially flat. Then the wonderful Industrial Revolution happened and things took off.